William Laman Furniture.Garden.Antiques - Round Rush Basket; Med. Garden → Garden Planters → Round Rush Basket; Med. Item No. 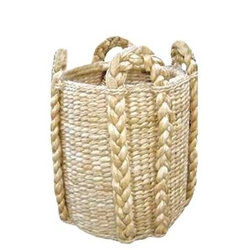 135 Medium woven Round Rush Basket with four handles, reinforced frame. Multi-use as a planter or log basket. For indoor our outdoor covered area.